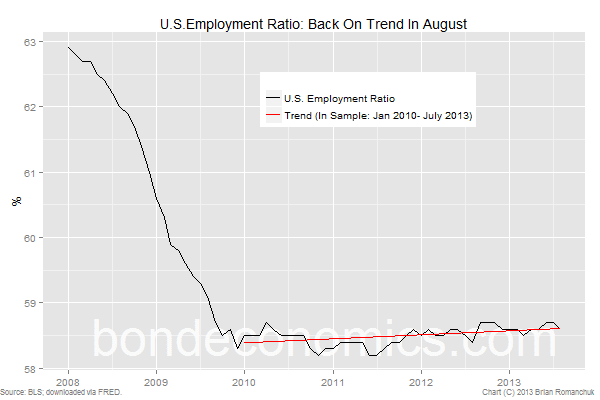 The greatly-anticipated August 2013 U.S. Employment Situation report hit the markets today, and managed to convey no new information. The numbers which I view as the most important were exactly in-line (when rounded to 0.1%) with my highly sophisticated straight line projections. The Treasury bond market recovered slightly in response, pulling the yield back into a trading range which is centered somewhere just below 3%. (I’ve seen technical analysts arguing that Armageddon will hit the Treasury bond market if the 10-year Note yield breaches 3%; I tend to think that the market could stay in a range even if the top end drifts a bit above 3%.) I see it as likely that the Fed will commence a slow tapering this month. But there is not enough information to say that the first rate hike will be before early 2015, which I view as being consistent with market pricing (with a reasonable risk premium). I would characterise the Household Survey data for August as lousy, with 115 thousand jobs lost on the month; the aggregate employment ratio slipped back to trend at 58.6%. The rounded Unemployment Rate dropped by 0.1% to 7.3% as a result of the Participation Rate dropping by 0.2% to 63.2%. The Household Survey is a properly-designed random survey and is noisy month-to-month, but the underlying trends appear stable. The crux of the matter is whether the Participation Rate can keep dropping, as it explains why the Unemployment Rate is declining. However, the pool of workers who can drop out of the labour force is declining in line with the Unemployment Rate. 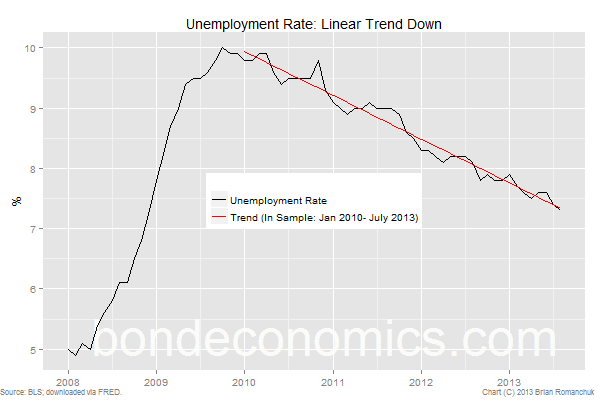 I would note that the Gallup-ing Unemployment Rate indicator did not prove too helpful this month. Within the Establishment Survey, the hourly wage data looked good, but I will take a look at those numbers some other time. As for the headline Nonfarm Payrolls number, I think it’s a fairly silly statistic. Market participants like keying on that number, since it is much smoother than the Household employment number. That smoothness is the result of algorithms that can lead the number to miss turning points in the economy (however, later revisions will fix that problem, so it is not apparent to those who used the revised data in historical analysis). The market also seems to care about ridiculously small differences in the data; the difference between the actual outturn (169,000 jobs in August) versus an above consensus 219,000 is 50 thousand jobs, or 0.037% of the total number of employees. In other words, the same outcome if you followed normal rounding rules of 0.1% followed by other economic data. When you consider the difficulties involved in seasonally adjusting the labour force data in an environment of an evolving mix of industries, it is somewhat difficult to take the market behaviour too seriously. On other fronts, the highly non-smoothed Canadian labour market data smashed expectations. I expect to discuss the situation in my home country next week.